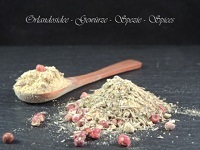 The mixed spices Creole goes wonderfully in a salad, with Artichokes or Auberginen with Feta cheese. Try it also with meat or fish its wonderful. Components of Mixture: fenugreek, Garlic, Ginger, Thyme und Pink Pepper.